The planetary system of the star GJ 9827, located about 100 light-years away from us in the constellation Pisces, includes what may be the most massive and dense planet of the super-earth class discovered to date, according to a new scientific paper conducted by a team of researchers led by Joanna Johanna Teske of the Carnegie Institution, USA. This new information allows astronomers to better understand the processes of formation of such planets. 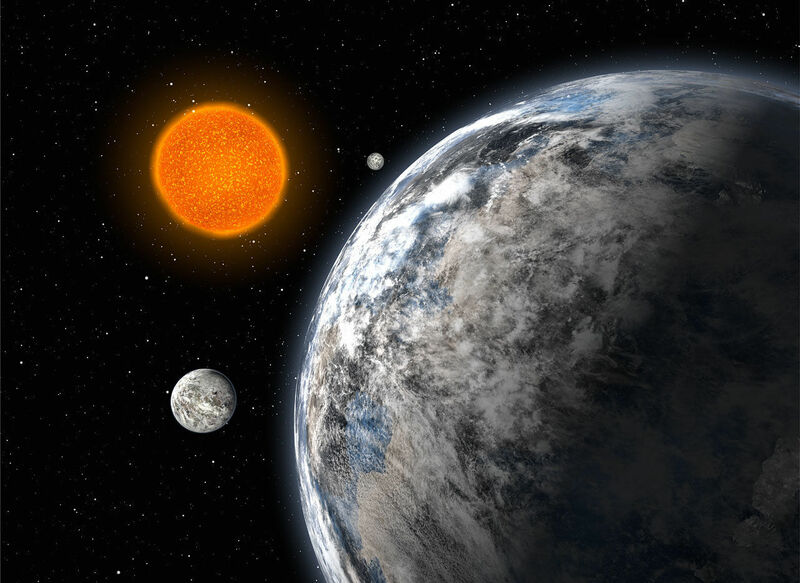 Around the star GJ 9827 is actually drawn a trio of planets discovered with the help of the “planet hunter” NASA Space Telescope Kepler (Kepler), and all three exoplanets in size slightly larger than the Earth. But scientists still do not know what these planets are composed of, whether they are similar to Earth or closer to the composition of gas planets such as Neptune. The fact is that according to the practice of observing exoplanets, if the radius of the planet exceeds 1.7 times the radius of the Earth, the planet is more often a Neptune-type gas planet, while planets of smaller radius are usually stony. The planets of the GJ 9827 system have intermediate dimensions – 1.64 times the radius of the Earth for planet b, 1.29 of the Earth’s radius for planet c and 2.08 of the radius of our planet for planet d. Therefore, their study is of particular interest to scientists. To determine the approximate composition of the substance of the planet, it is required, in addition to its radius, to know the diameter – this allows us to calculate the average density of matter, which can tell a lot about the nature of the planet’s material. In her study, Teske’s group determined that the mass of planet b is about 8 times the mass of the Earth, which makes it one of the most massive and dense super-earths known to science. The masses of planets c and d make up 2 and 4 Earth masses, respectively, although the uncertainty of these two dimensions is quite high. These data show that planet d has a very thick gas shell and leave open the question of the presence of such a gas shell around the planet c. However, a more accurate measurement of the mass of the planet b allows us to conclude that the planet is 50 percent iron.